Apparently I forgot to add words to these pictures. Oops. This car needs no introduction. A car that took the world by storm not only by its ability and craftsmanship, but also by the sheer amount of time it took for it to materialize. Over 10 years of R&D went into this halo car, and they still lost money on every one. Did Lexus (Toyota) care? No, because what they sought was a piece of automotive excellence in form and function above all else. I think they succeeded. Not going to lie, I was drawing a blank with what to name his shoot so thanks to shoopdawoop993 for the rather inspiring comment. It is a very impressive spoiler indeed, my friend. I’m sure we’ve all seen an LFA or two at some point, but this is the first time I’ve captured one through my lenses. The first time I’ve been able to appreciate these sleek yet very aggressive lines, and take in the way the body was moulded. A bit before it’s time when it was designed, I guess you could say. A modern classic. The wing is the first piece everybody goes to. Topping off the carbon-fiber reinforced plastic body is that giant hydraulically actuated aerofoil that automatically deploys and retracts based on vehicle speed. What I always appreciated about it was not just the size, but how well incorporated with the rear end it was. Unlike the Carrera GT, this wing doesnt simply appear - its endplates seemingly rise up out of nowhere and the cavity is filled in seamlessly with a Gurney-flap equipped panel. The intakes flanking each side of the cabin are small, but play a major role in how the tip of the car was sculpted. The flow of air passing over top the car is firmly attached to the body by this channel leading into the intake, further held in place by the inner contours of the mirrors. Out back, the car is quite massive. There really is no hiding the massive 1LR 4.8L V10 and all the cooling that goes with it, but the design team still did their best to make it attractive. The large grills and bulbous lights help to shrink the rear end, whilst the diffuser helps raise it, making it seem not as low as it actually is. Right in the middle of this carbon diffuser is the triple-tipped Yamaha-tuned exhaust that we all know and love. Tuned to be acoustically pleasing to whomever is graced by this car, its a sound that is truly unlike any other. The space wasn’t ideal for many photos and being a dealership, people had actual work to do so I very briefly drank in the last few details. The aerodynamics on this car is always so impressive compared to what was available around the time the GTR was revived. 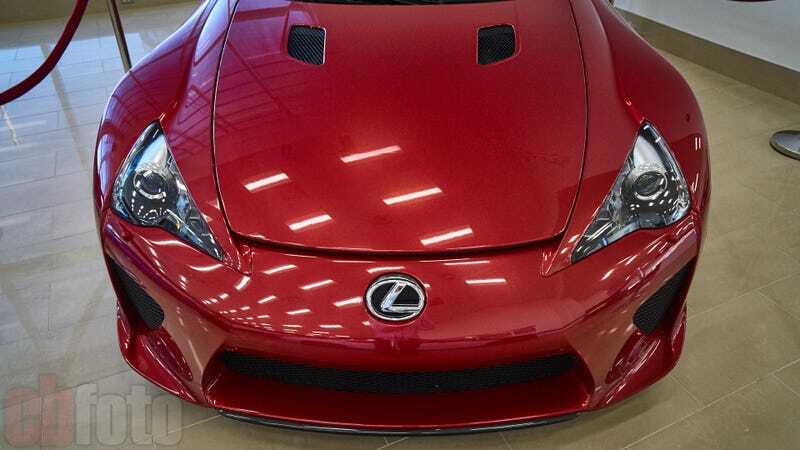 This particular LFA has been at this dealership for quite a few years now, presumably belonging to the owner. Regardless of whether it gets driven or not, I’m glad to see it being taken care of so well. Relatively clean, the condition of the paint is immaculate (minus a few pesky fingerprints and dust) - it even has brand new Bridgestone Potenza tires and registration until 2018! The colour really grew on me at this point. Not quite sure if this is the standard red or Pearl Red, but it’s a nice deep shine. Not as metallic as the McLaren shade, but quite pretty nonetheless. $kaybait I guess, if she’s still around. A quick glance at the Brembo carbon brakes then, to close out the shoot. These carbon ceramic discs seem like they’ve barely been touched but with their massive size (390mm/360mm) there is no doubt this car can slow down quickly. The 20in forged BBS wheels are also a sight to behold, truly something one associates with world-class motorsports. The interior was absolutely spotless! The LFA truly served its purpose of being a halo car, and while it is seemingly forgotten from the memories of many, you have to appreciate what it did for the Lexus brand. Not only in styling, many cues of which we still see in their current offerings, but also in showing the world what F-Sport is capable of. Really enjoyed shooting one of the hidden gems of Toronto, and looking forward to getting some proper photos of another example sometime in the future. Until next we meet, you beautiful thing you.